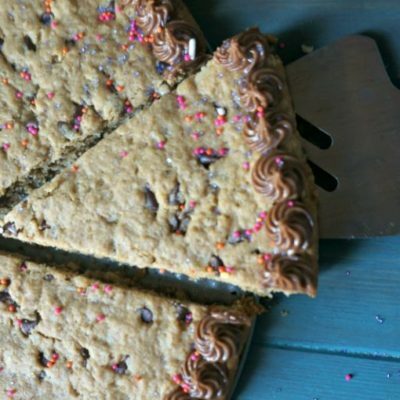 Gluten Free Cookie Cake: A gluten-free version of a cookie cake that tastes so good no one will know it is gluten-free. It really wasn’t until recent years that I heard about a cookie cake. I heard people mention them several times, but I just nodded and smiles, stumped because I had never seen one–yes, clearly I live in a hole. But seriously, what a GENIUS idea. Especially for this gal who is really not much of a cake person. Brownies? Yes. Ice cream? Yes. Cookies? Yes. Cake? Not so much. Cookie Cake? Well, yes please. I mean what is better than a giant chocolate chip cookie with icing? Because just so you know, it is the cake part I typically don’t like, the icing I have no issue with. So enter a cookie cake. But not just any cookie cake, a gluten-free cookie cake. But not a gluten-free dessert that uses all sorts of fancy flours–one that is made with simple ingredients and tastes AMAZING!!! 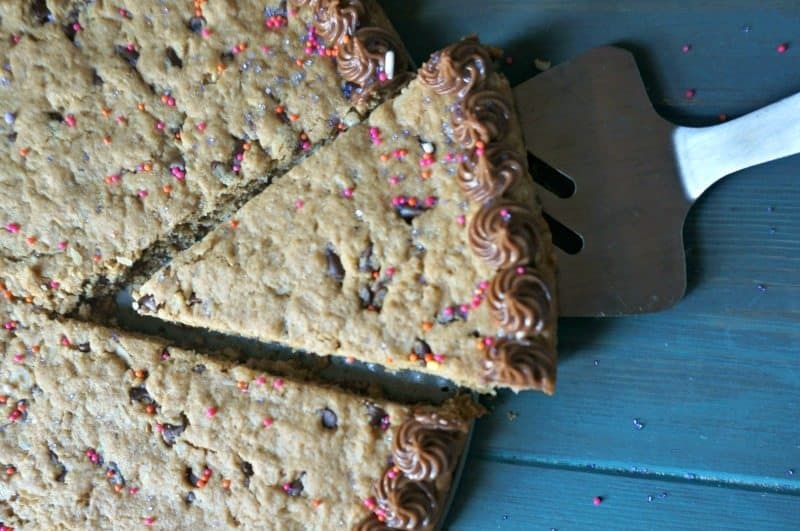 Why did I make this Cookie Cake gluten-free? Well, years ago, my son and I were both gluten-free. And we went to many parties over that time that there were no dessert options for us. Not very fun for a 4-year-old boy or his mom’s sweet tooth!! So ever since that time, I always want to have gluten-free options for friends or company if needed–without having to buy special flours or mixes. 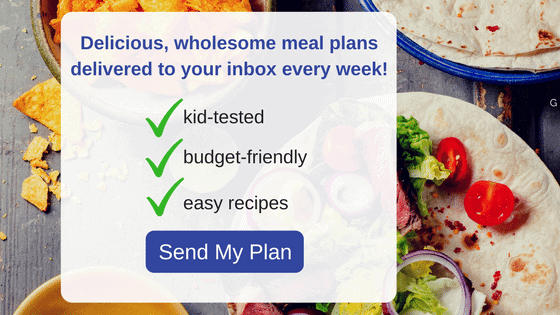 Wouldn’t it be nice if you could always have an easy, tasty go-to gluten-free recipe for yourself or your gluten-free friends? 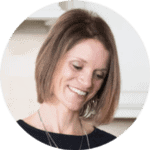 I can promise you, it goes a long to way when you accommodate allergies–especially when there are children involved. I sure think so. And I think this needs to be your go to recipe. Be sure to use certified gluten-free oats. Quick cooking oats or regular old fashioned oats both work well to be blended into oat flour. Check out all my Oats Recipes for many recipes using oats of all varieties. The oats are to be measured BEFORE blending in this recipe for Chocolate Chip Peanut Butter Cookie Cake. If you don’t like peanut butter or have an allergy, feel free to sub it out for almond butter. A gluten free version of a giant chocolate chip cookie. Place oats in blender and blend until fairly smooth. Mix together with baking soda and set aside. Cream peanut butter, butter and sugars together until smooth. Add in egg and vanilla, beating until smooth. Stir in oats. Add in chocolate chips and mix until just combined. In a 9 inch springform pan, or pizza pan, spread out dough evenly, leaving a 1/2 inch border around edges of pan. Bake for 18-20 minutes until center is set. Beat together the butter and peanut butter and add in powdered sugar slowly.Be sure your powdered sugar is sifted to prevent clumps in your icing. Add 1 tablespoon of milk at a time, to thin icing to desired consistency. Pipe out frosting along edges or to spell out Happy Birthday. I love a good cookie cake! Yours looks perfect! I’ve got a birthday this week….I know what I’m asking for!! Well Happy birthday to you sweet friend!! Enjoy a big slice of this cake!! Totally pinned this! I need this on my birthday list! Thanks Melissa! You won’t be disappointed! Looks fabulous! Can never have too many cookies! Thanks Allie–and yes, this is designed to be an easy, any one can make gfree dessert! What a delightful looking dessert. I try to go gluten free when I can. It just makes me feel better. I adore cookie pies like this. What a great option for gf-ers! It makes a lot of people feel better. I am lucky I don’t have to be gfree–regardless, this cake is tasty! 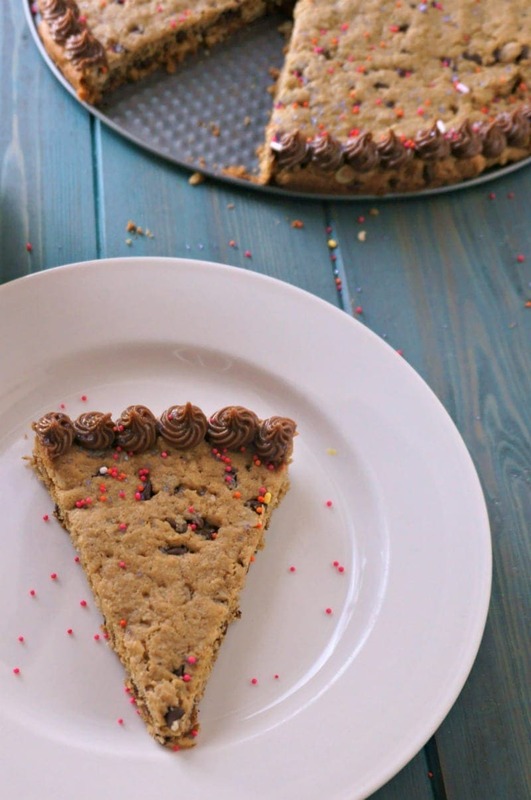 Gluten free cookie cake! I am so happy I saw this post!! Yea!! I am so happy you saw it too! Hi! 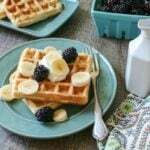 Can you use chunky peanut butter or do you recommend creamy for this recipe? Hi Melanie, while I LOVE crunchy peanut butter and would love the added texture in this cake, because the peanut butter is working like butter, I would only stick to creamy. If you do experiment with crunchy and it works, let us know! I would never have guessed this is gluten free. It’s sooooooo good, and my kids gobbled it right up! No one ever guesses this one is gluten free–so glad your family enjoyed April! It is a great party dessert for celiacs, or gluten intolerant guests that EVERYONE loves.